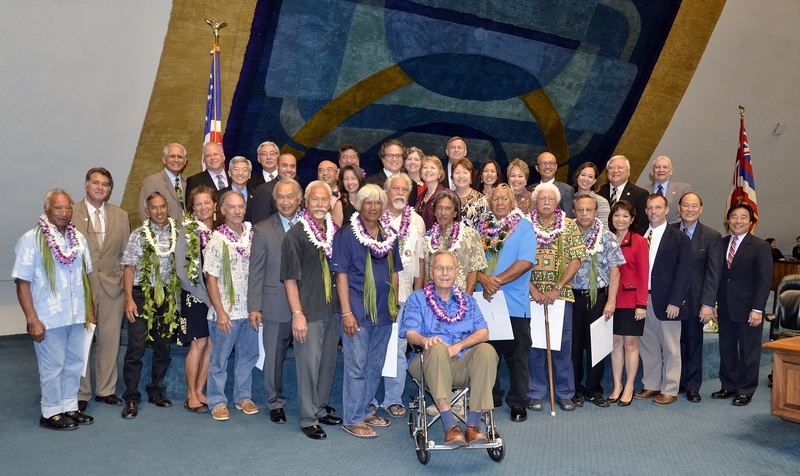 The Hawai’i State Senate with 12 of the 13 living crewmembers of the Hōkūleʻa’s maiden voyage. Various lawmakers in both the Senate and House chambers recognized the Polynesian Voyaging Society, as well as 12 of the 13 living crewmembers of Hokulea’s maiden voyage from Hawaii to Tahiti and back in 1976. PVS was founded in 1973 by Herb Kane, Ben Finney and Tommy Holmes. Then on March 8, 1975, PVS launched its first waa kaulua, the Hokulea, in Kaneohe Bay. Her maiden voyage to Tahiti in 1976 was led by Mau Piailug, using traditional, non-instrument navigation. “We are grateful to have our governmental body take the time to celebrate the worldwide voyage and to me, it shows that Hawaii is still with us, that the canoe still matters. As the voyage now heads into the Indian Ocean, which is much more dangerous, it gives us the strength to set sail,” said Nainoa Thompson, pwo (master) navigator and president of PVS. Joining Thompson from the crew were Finney, Abraham “Snake” Ah Nee, Milton “Shorty” Bertelmann, Richard “Buffalo” Keaulana, John Kruse, Francis Kainoa Lee, Kimo Lyman, Gordon Piianaia, Penny Martin, Billy Richards and Dr. Ben Young. It was the first time all living members of the original crew were together since that groundbreaking voyage. “We could not have predicted today’s event when we launched 40 years ago. We thought we might make a splash, but it turned into something so much larger,” said Finney. “Your island is like a canoe and your canoe is like an island. To take those lessons that we learned on Hokulea and then to bring them back and to apply it to the community to the island that you live on,” Martin said. Hokulea and her sister canoe Hikianalia continue their Malama Honua Worldwide Voyage, which launched from Hilo in 2013. The canoes are currently docked in New Zealand. By the end of the voyage in 2017, the canoes hope to have traveled approximately 47,000 nautical miles. Volunteers and employees from the University of Hawaii were also honored as they have long helped to house and care for Hokulea. A commanding Hawaiian surfer from Mākaha, Oʻahu; winner of the 1960 Makaha International; and often referred to as the “Mayor of Mākaha,” Richard Keaulana was born (1935) in Honolulu, and moved with his family to Mākaha, on Oʻahu’s west side, at age five. He learned to surf as a child at Waikīkī, and made his first surfboard by taking a machete to a blank assembled from glued-together railroad ties. Keaulana worked as a Waikīkī beach boy in the 1950s and earned his nickname “Buffalo” for his generously proportioned head and shaggy reddish-brown hair. A perennial favorite in the Mākaha International contest, Keaulana placed third in 1957, second in 1958, and first in 1960. He was also regarded as the world’s best bodysurfer. Buffalo was appointed head lifeguard at Mākaha in 1969, a post he held until 1995. The Buffalo Big Board Classic debuted in 1977, a surf contest/beach party that immediately became a local institution. Keaulana is married with six children, including big-wave expert Brian and three-time longboard world champion Russ. 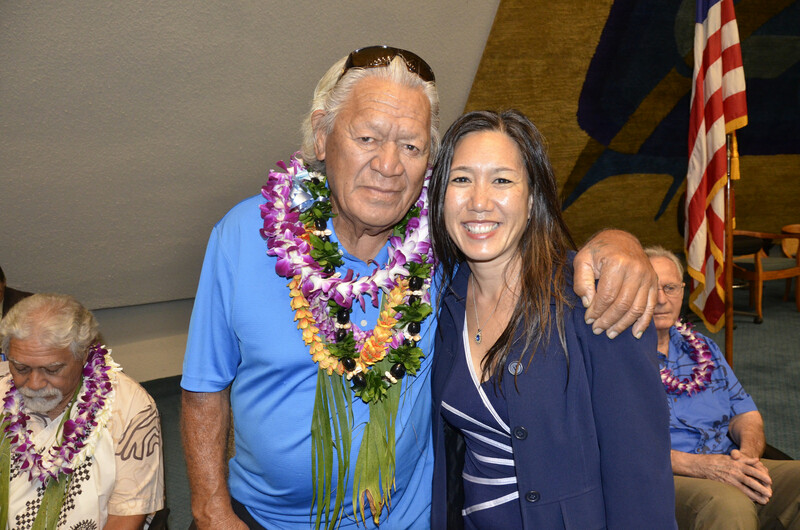 Note from Senator Shimabukuro: Big Mahalo Nui Loa to Senator Gilbert Kahele of Hawaii Island and his staff for preparing all the speeches and overseeing the Hōkūleʻa floor presentation on April 6, 2015.